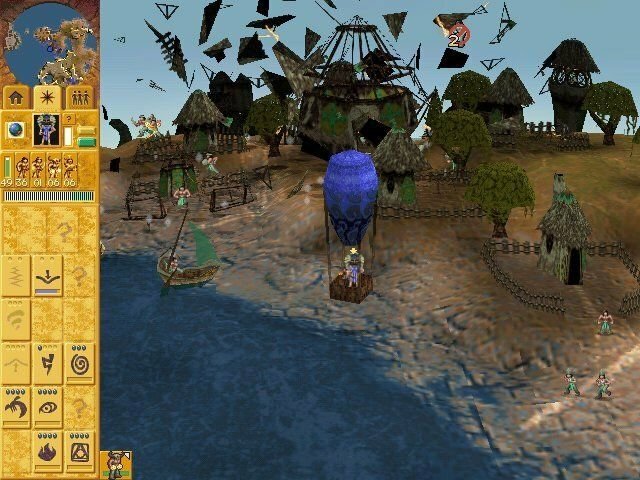 For people who remember Bullfrog’s Populous and Populous II, Populous: The Beginning is likely to come as a rude shock. It bears little resemblance to those classic strategy games, in which you played a godlike figure using his power to direct followers in a quest for supremacy over nonbelievers. You didn’t so much command these followers as influence them through a little godly persuasion and fear. 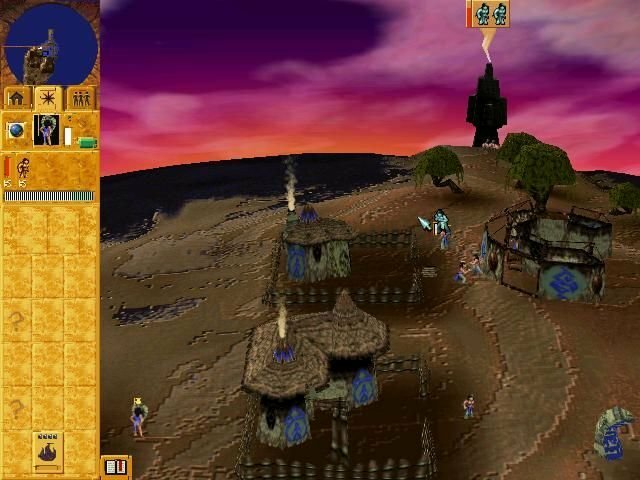 Getting them to do what you want was one of the appealing challenges of the game, along with the ability to cast Olympian spells and warp the landscape itself. Bullfrog, however, has wandered far from that formula to create something unique — but ultimately less fulfilling. It’s as though they started to make a sequel to Populous and ended up with one to Magic Carpet 2, with a detour toward Dungeon Keeper along the way. If that sounds like an uneasy mix, it is. 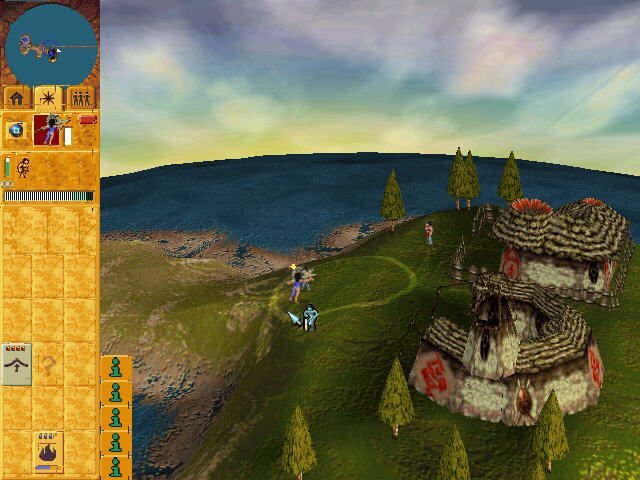 At first glance, Populous: The Beginning appears to be a standard Populous game with a brand-new 3D engine. In practice, however, it’s a completely different beast. 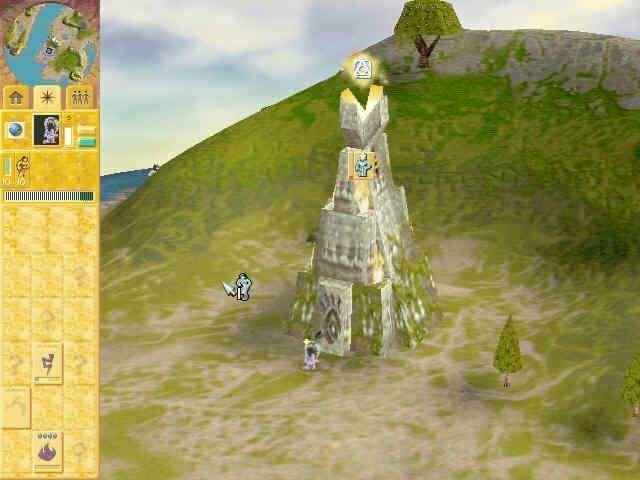 Some of the salient points of the originals are indeed here: You do have a grab-bag of great spells, you do have followers, and you can alter the landscape. But rather than being a full-blown, thunderbolt-wielding god-from-the-mountain-top, you’re a god-in-training called the Shaman. 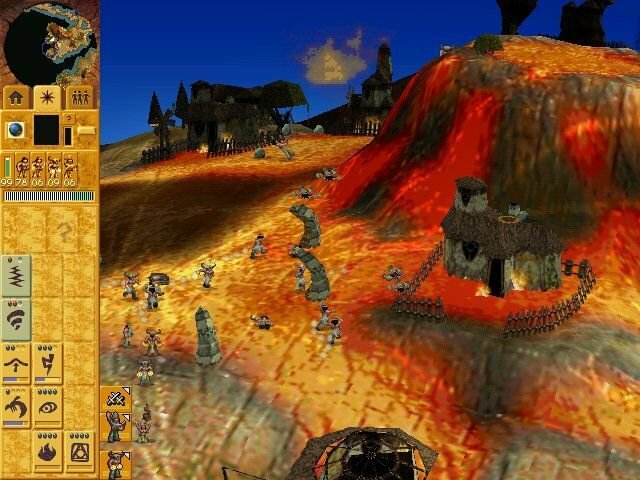 Instead of influencing your worshippers, you actually lead them into battle and physically control their movements and actions, real-time strategy-style. The Shaman is the core unit in the game. As a god wannabe, your shaman needs to prove her mettle by conquering the universe through a series of hard-wired scenarios. Each scenario in the ongoing campaign begins with your Shaman and a small group of followers in a Reincarnation Circle, and each one follows the same course: You must create or convert more followers, train them, and kill any other Shamans on the map. There are several ways to do this, but the basic pattern rarely wavers, and that’s the heart of the problem. 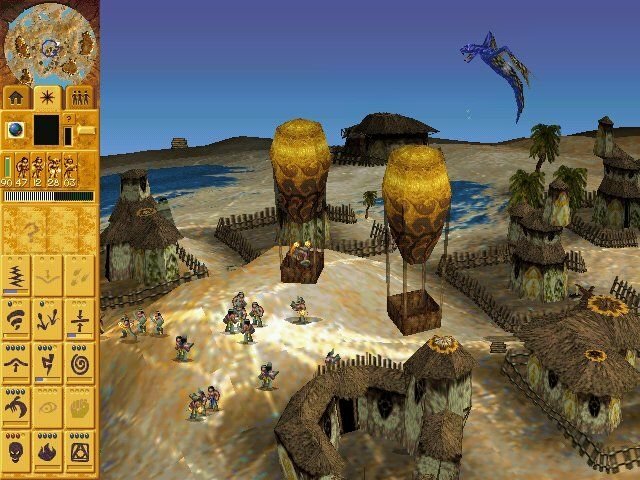 The campaign follows a direct path through a series of planetary conquest missions. 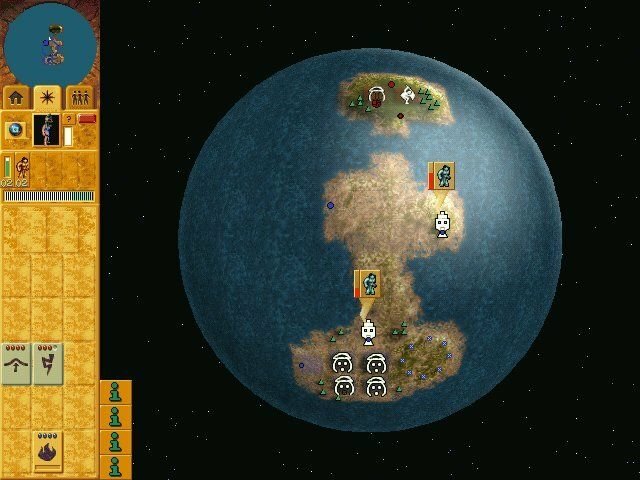 The globes are all fairly small, and you begin each new battle with a guided tour of the planet to point out special sites and mission objectives. These landscapes are rendered in bright, reasonably detailed 3D, full of mountains, oceans, trees, structures, and followers. You can zoom in and out, rotate in any direction, and fly around the whole planet with simple keyboard commands. 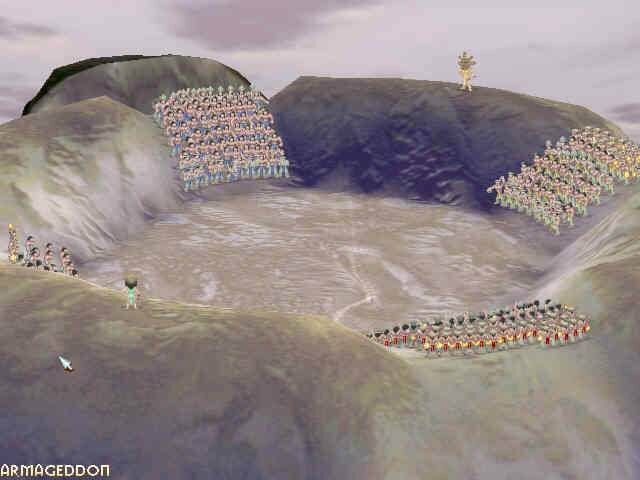 The resemblance to Bullfrog’s Magic Carpet is strong, but instead of using the 3D to provide a you-are-there perspective, Populous: The Beginning simply uses it to render the world, with the central figures in the action represented by little guys running around. The tour of each map not only shows you the goals and highlights, but pretty much tells you how to solve each battle (and there is a definite solution; it’s not simply a matter of sound strategic planning). First, you must train your basic follower units, the Braves, to be either Warriors or Priests; the only combatant classes in the whole game. Braves can gather wood and build structures. When placed in a hut, they get busy making other Braves. 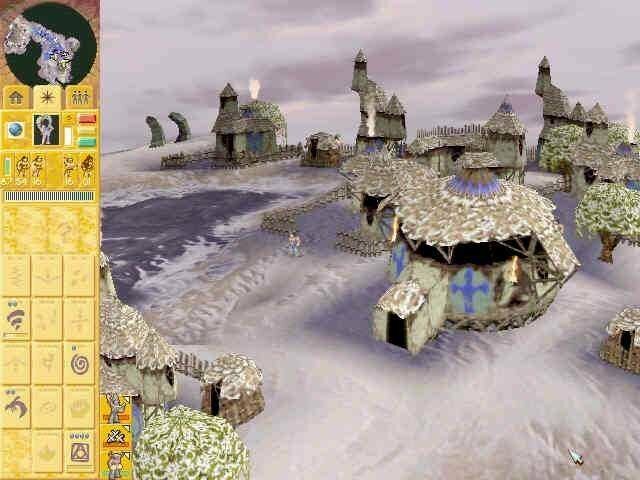 Braves can also build a Warrior Hut (in which to train Warriors), Temple (to train Priests), Guard Tower (for better defense), Fire Warrior Hut (makes Warriors into Fire Warriors), Spy Hut (trains Spies), Balloon Hut (makes hot air balloons), and Boat hut (makes boats). That’s pretty much it for buildings and units. 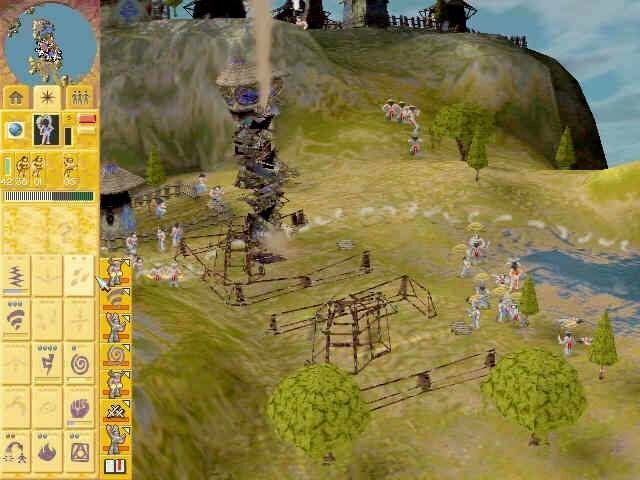 Warriors and Fire Warriors fight the battles, preachers can convert the enemy to your cause and prevent your units from being converted, and spies can dress in enemy garb and sabotage buildings. Any of these followers can be placed in a boat to cross water or in a hot air balloon to cross mountains. The only really novel touch is the ability to rain fire attacks from balloons. 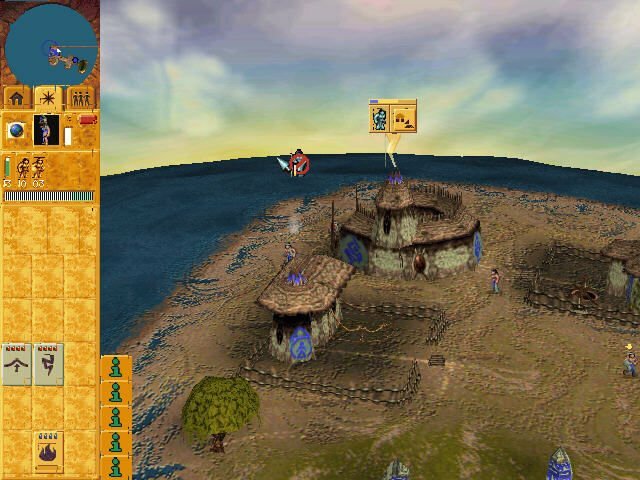 What you wind up with is a pretty standard real-time strategy game with very few units and buildings and a decent graphics engine. 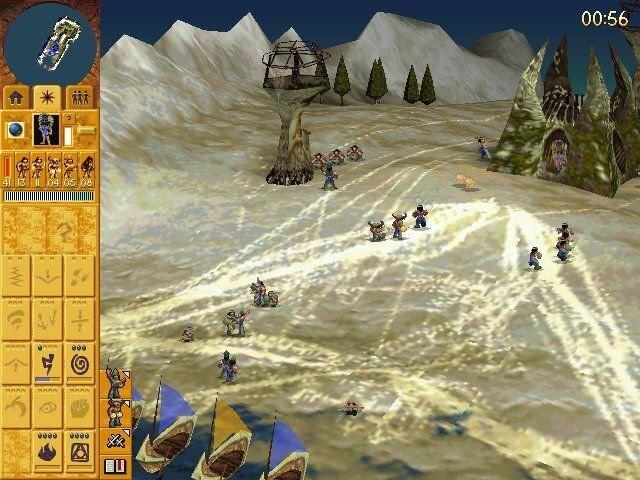 Tactically, Populous: The Beginning becomes nothing more than building a larger army than the other guy – with the added effect of a few cool spells and a novel camera system. Eventually, the missions become mind-numbingly repetitive and are rarely very challenging. 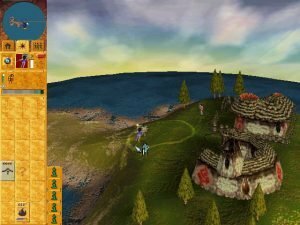 Despite all of this, Populous: The Beginning can be good fun, and while it’s possible not as great as the first two games, it definitely brings enough cool to the table to make it worth a look.